My work over the last decade has broadly concerned interaction between media and cities. This has ranged from analysing the ways that older media technologies such as photography and cinema shaped urban imagination and social life in the 19th and 20th centuries to exploring the impact of more recent digital platforms in reconfiguring public space. In this talk I will outline the concept of 'geomedia' as a frame for understanding both the new spatialisation of media in contemporary cities, and the ways that pervasive media are altering urban spatial experience, including fundamental processes of social encounter. I will also advance the concept of the 'communicative city' as a potential paradigm for better understanding and assessing the different trajectories associated with the digitisation of urban space. Scott McQuire is Professor of Media and Communications in the School of Culture and Communication at the University of Melbourne. He is one of the founders of the interdisciplinary Research Unit in Public Cultures, and is Deputy-Director of the Melbourne Networked Society Institute. His books include The Media City: media, architecture and urban space (2008) which won the 2009 Jane Jacobs Publication Award offered by the Urban Communication Foundation and Geomedia: networked cities and the future of public space (2016), which is being translated into Chinese and Russian. Image: Rafael Lozano-Hemmer, "Solar Equation, Relational Architecture 16", 2010. 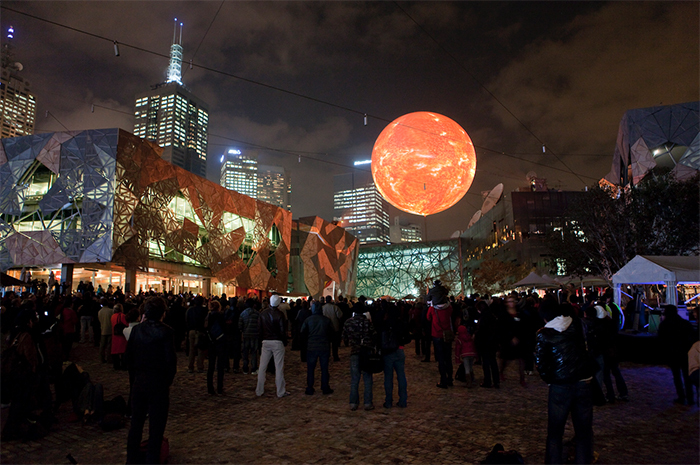 Federation Square, The Light in Winter Festival, Melbourne, Australia. Photo: Marcel Aucar.